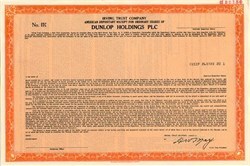 Beautiful engraved ADR specimen certificate from the Dunlop Holdings PLC dated in 1983. This historic document was printed by Security-Columbian Bank Note Company and has an ornate border around it. This item has the printed signatures of the Company's SVP and is over 24 years old. Dunlop was a holding company whose operations manufactured a number of products, including tires and sports equipment.